President Obama’s time in the White House is ended, and after eight years, his administration has imposed more than 3,000 regulations and added nearly $8 trillion to the national debt. Obama started his presidency on a wave of optimism, working with a Democratic-controlled Congress to pass a $831 billion stimulus package, financial reform and a bill to overhaul health coverage — his namesake, Obamacare. But Obama’s costly health care law cost his party dearly, and by his second term Republicans controlled the House in 2010, and then took over the Senate in 2014. Obama turned to alternative policy-making tools, using his “pen and phone” to regulate what he could not legislate. 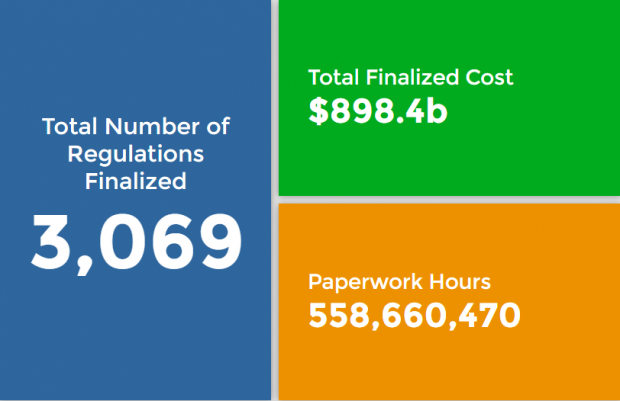 The Obama administration put out 3,069 regulations, adding nearly $900 billion in costs to the economy. Obama’s main focuses were fighting global warming and immigration. Obama’s rules added nearly 572,000 pages to the Federal Register, including a whopping 97,110 pages in 2016 alone — an all-time record. Regulators pushed rules governing carbon dioxide emissions from cars to power plants, and Obama issued executive actions to unilaterally change aspects of immigration enforcement. He didn’t need Congress, but his actions may have had the unintended consequence of hurting Hillary Clinton’s 2016 campaign. As a long-time advocate for socialized medicine, Clinton had to answer for rising health care costs, which many attributed to Obamacare. Clinton also doubled down on the Obama regulations that targeted coal and forced coal plants and mines to shut down. Coal states turned dark red as a result. But Obama’s agenda came with a cost. The national debt increased from more than $10.6 trillion in January 2009 to $19.6 trillion at the end of fiscal year 2016. Experts say Obama presided over a nearly $8 trillion increase in the national debt — some spending in early 2009 is attributed to former President George W. Bush. But Obama may not have much of a legacy if President-elect Donald Trump gets his way. Trump has pledged to undo many of Obama’s policies and expects to immediately sign as many as 200 executive orders. Trump’s executive orders can only get him so far, though. Congress will have to pass legislation to repeal many Obama-era regulations and policies. But the new president-elect is confident, however, that he can accomplish his policy goals. “You’re going to cheer me on but I’m going to be cheering you on because what we’ve done is so special,” Trump told supporters Thursday night at his inauguration concert at the Lincoln Memorial.